Rejecting the 'protectionist policies' of the US, Finance Minister Pranab Mukherjee said on Thursday free flow of goods, services and capital would ease the global financial crisis. "Protectionist policies are not acceptable," Mukherjee told PTI after landing in New York on Wednesday where he stopped for a day to address the India Investment Forum. The minister is expected to take up the issue of protectionist measures by the US with top government officials, including Secretary of State Hillary Clinton. "We shall have to keep in view that if the world economy is to come out of the present crisis, then protectionism is not the answer," Mukherjee said. 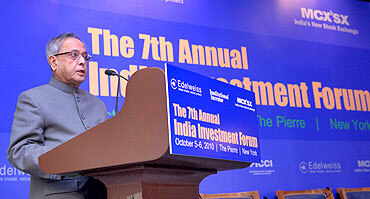 Image: Finance Minister Pranab Mukherjee delivers keynote address at the 7th Annual India Investment Forum. Noting that the US protectionist policies could impact Indias software companies, the minister said that the financial crisis would ease if 'uninterrupted flow of goods and services and capital are allowed to take place'. Protectionist measures like Ohio state banning outsourcing of state IT contracts to companies in places like Bangalore had stirred a hornet's nest in India. The move was preceded by Washington's decision to hike fee for H-1B and L1 visas to fund a US border security fund. This had also invited strong criticism in India. Indian software exporters fear both these measures would hit the $50 billion Indian IT industry which earn more than 50 per cent of its revenues from America. However late last month, Republicans in the US Senate successfully blocked the passage of an anti-offshoring bill that would have denied tax breaks to US companies which move jobs overseas. 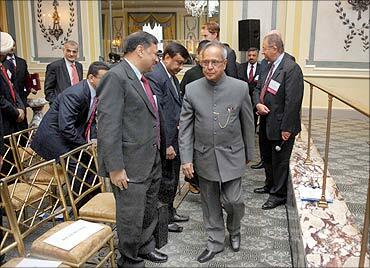 Image: Pranab Mukherjee arrives at the 7th Annual India Investment Forum venue. The Bill proposed a ban on government contractors from using American taxpayers' money to move jobs offshore. Mukherjee said India would be speaking out against protectionism at the meeting of the Finance ministers of G20 countries in South Korea later this month. "If there be no robust demand for exports from the developed countries then our exports may suffer. . .it may affect our trade balance in the course of time," he said. 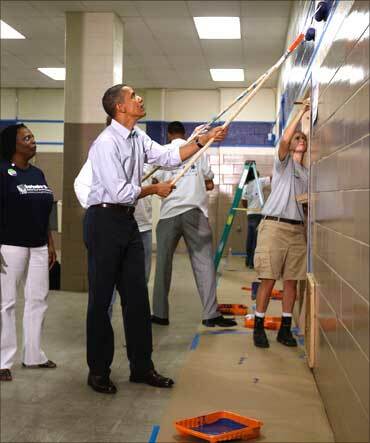 Image: Pranab Mukherjee in the US. Mukherjee's US visit follows a bilateral meeting between Foreign Minister S M Krishna and Secretary of State Hillary Clinton last month, where India had voiced its concerns about the hike in visa fee, export controls and ban on government outsourcing. Touching upon the Indian economy, the finance minister said it was still too early to say that the country has come out of the financial crisis. "After watching the status of growth in the second quarter and third quarter I will be in a position stay whether we are total out of it or not," he said. Indian economy grew at 8.8 per cent during the first quarter of current fiscal. The government had projected a growth of over 8.5 per cent for the whole fiscal. Corporate care: How Ma Foi helps poor students!